1: The Assyrian homeland, encompassing the Assyrian cities of Ninevah and Nimrud is located in which modern nation? 2: Akkadian, the early language of the ancient Assyrians is part of which broad language family? 3: After a period of decline, the Assyrians re-emerged as a major force in the 9th-7th Centuries BC, building the largest Empire the world had yet seen, known as the�..
4: Which of these places did the Assyrians not conquer? 5: Which of these ethnic groups was not subject to forced migrations under the Assyrian Empire? 6: Assyrian art was well known for its political propoganda, which commonly displayed Assyrian Kings�. 7: Which of these cities was never the capital of the Assyrian Empire? 8: Which language gradually replaced Akkadian as the primary language of the Assyrian Empire? 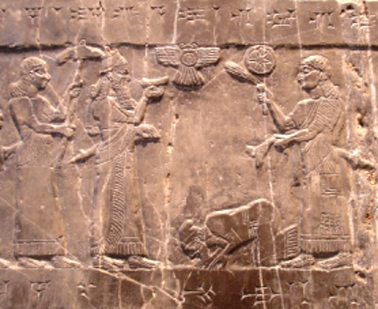 9: This image shows which King bowing at the feet of the Assyrian King Shalmeneser III? 10: The Neo-Assyrian Empire was finaly destroyed by�.